B1761. Bernard Shaw. 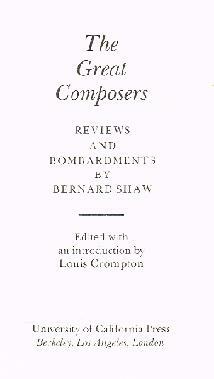 The Great Composers - Reviews and Bombardments. Louis Crompton, Ed. Berkeley, University of California Press, 1978. 378pp. Index. “Shaw's musical reviews are far and away the most 'helpful' I ever expect to read, which does not mean that I agree with half of them. I am probably nearly as opinionated as he was and I am certainly nowhere near as talented, and criticism that is helpful to me is criticism that shows independent thought and goads me into some, not criticism that supports my prejudices which do not need any of that. This book is literature, it is important to the history of a musical epoch before the gramophone as well as being before Stravinsky, Britten, Bartók and Schönberg, and of course it is sociology and politics, and above all it is entertainment. I can't get annoyed even by his most perverse nonsense such as that the Great C Major symphony was the most brainless composition ever. A free mind and spirit combined with a brain and sensibility the size of Shaw's is bound to veer off in some strange directions at times. In the last resort the man said the most illuminating things about music I have ever read. We all know that he was a devotée of Wagner (particularly of THE RHINEGOLD) and could not abide Brahms, but it is precisely Shaw's early attacks on Brahms, before his recantation, that made sense of Brahms to me. These days we seem to have outgrown the cloth-eared criticisms of Brahms' sound that used to pass for orthodoxy, but Shaw never fell into that Serbonian critical bog in the first place. And you would never dream from reading Shaw that a whole dispute raged over Brahms' status or otherwise as some second Beethoven. Shaw had at first swallowed whole Wagner's theory that music had advanced historically from its 'absolute' phase to a new era where it required an underlying poetic idea. Wagner saw this as the logical development from Beethoven, and Shaw was outraged that Brahms was putting the whole process into reverse. Far from being any second Beethoven, Brahms was a different animal entirely, in effect anti-Beethoven. The sheer power of Brahms's music has established him, but I am not sure we have yet outgrown the decades of intellectual twaddle, largely from his admirers, that show a complete misunderstanding of what his music is all about. Implicit in Shaw's view is the clearest and best understanding I have ever come across of what 'absolute' music is. The great Tovey got into a hopeless tangle over the issue, chiefly because of his compulsion to prove to himself that Beethoven was The Greatest in every imaginable respect. To Shaw, Brahms wrote absolute music and Beethoven largely did not, and that perception makes both of them a lot clearer to me.